India, Israel, and Pakistan never signed the NPT and possess nuclear arsenals. Iraq initiated a secret nuclear program under Saddam Hussein before the 1991 Persian Gulf War. North Korea announced its withdrawal from the NPT in January 2003 and has tested nuclear devices since that time. Iran and Libya have pursued secret nuclear activities in violation of the treaty’s terms, and Syria is suspected of having done the same. Still, nuclear nonproliferation successes outnumber failures and dire forecasts decades ago that the world would be home to dozens of states armed with nuclear weapons have not come to pass. At the time the NPT was concluded, the nuclear stockpiles of both the United States and the Soviet Union/Russia numbered in the tens of thousands. Beginning in the 1970s, U.S. and Soviet/Russian leaders negotiated a series of bilateral arms control agreements and initiatives that limited, and later helped to reduce, the size of their nuclear arsenals. Today, the United States and Russia each deploy roughly 1,400 strategic warheads on several hundred bombers and missiles, and are modernizing their nuclear delivery systems. The nuclear-weapon states (NWS) are the five states—China, France, Russia, United Kingdom, and the United States—officially recognized as possessing nuclear weapons by the NPT. The treaty legitimizes these states’ nuclear arsenals, but establishes they are not supposed to build and maintain such weapons in perpetuity. In 2000, the NWS committed themselves to an “unequivocal undertaking…to accomplish the total elimination of their nuclear arsenals.” Because of the secretive nature with which most governments treat information about their nuclear arsenals, most of the figures below are best estimates of each nuclear-weapon state’s nuclear holdings, including both strategic warheads and lower-yield devices referred to as tactical weapons. No known weapons or sufficient fissile material stockpiles to build weapons. July 2015: Iran and six world powers negotiated a long-term agreement to verify and significantly reduce Iran's capacity to produce material for nuclear weapons. As part of this agreement, the IAEA and Iran concluded an investigation into Iran’s past nuclear weapons-related activities. The agency concluded that Iran had an organized program to pursue nuclear weapons prior to 2003. Some of these activities continued through 2009, but there were no indications of weaponization activities taking place after that date. Estimated as of January 2018 to have approximately 10-20 warheads and the fissile material for 30-60 nuclear weapons. While there is a high degree of uncertainty surrounding North Korea's fissile material stockpile and production, particularly on the uranium enrichment side, North Korea is estimated to have 20-40 kilograms of plutonium and 250-500 kilograms of highly enriched uranium. The estimated annual production of fissile material is enough for 6-7 weapons. North Korea operates its 5-megawatt heavy-water graphite-moderated reactor used to extract plutonium in the past for nuclear warheads on an intermittent basis since August 2013. There has also been activity at North Korea's reprocessing facility in 2016, indicating that Pyongyang has likely separated plutonium from the reactor's spent fuel. North Korea unveiled a centrifuge facility in 2010, but it is unclear if Pyongyang is using the facility to produce highly-enriched uranium for weapons. By 2020, experts estimate that North Korea could have anywhere between 20-100 nuclear warheads based on the rate of its stockpile growth and technological improvements. September 2007: Israel conducted an airstrike on what U.S. officials alleged was the construction site of a nuclear research reactor similar to North Korea’s Yongbyon reactor. The extent of Syrian-North Korean nuclear cooperation is unclear, but is believed to have begun in 1997. Investigations into U.S. claims uncovered traces of undeclared man-made uranium particles at both the site of the destroyed facility and Syria’s declared research reactor. Syria has not adequately cooperated with the IAEA to clarify the nature of the destroyed facility and procurement efforts that could be related to a nuclear program. Belarus, Kazakhstan, and Ukraine inherited nuclear weapons following the Soviet Union’s 1991 collapse, but returned them to Russia and joined the NPT as non-nuclear-weapon states. South Africa secretly developed but subsequently dismantled its small number of nuclear warheads and also joined the NPT in 1991. Iraq had an active nuclear weapons program prior to the 1991 Persian Gulf War, but was forced to verifiably dismantle it under the supervision of UN inspectors. The U.S.-led March 2003 invasion of Iraq and subsequent capture of Iraqi leader Saddam Hussein definitively ended his regime’s pursuit of nuclear weapons. Libya voluntarily renounced its secret nuclear weapons efforts in December 2003. Argentina, Brazil, South Korea, and Taiwan also shelved nuclear weapons programs. The Arms Control Association was pleased to convene two telebriefings following the close of the U.S.-North Korean summit between President Donald Trump and North Korean leader Kim Jong Un. Recordings of the two telebriefings are available to accredited journalists upon request. Contact Tony Fleming, director for communications, to inquire. Negotiating a denuclearization agreement will be a long-term, complex process. It will be critical for the two leaders to have created a framework for sustained talks and avoid pitfalls that disrupted past diplomatic efforts and risk putting the United States and North Korea back on the path of confrontation. With U.S.-Russia relations at the lowest point since the end of the Cold War, arms control efforts are even more vital to contain nuclear risks. For more than 50 years, the leaders of the United States and Russia have recognized the value of nuclear arms control. In the past two decades, agreements between Washington and Moscow resulted in significant reductions in both nations’ nuclear weapons arsenals in a reciprocal, transparent, and verifiable manner. Nuclear arms control treaties and the associated dialogue they fostered have enabled both countries to reduce and manage the risks of nuclear confrontation and competition throughout the course of the Cold War and beyond. Today, with relations among Washington, Moscow, and Europe at their lowest point since the end of the Cold War, nuclear arms control is even more vital to contain nuclear risks, ease worsening U.S.-Russian tensions, and prevent a new nuclear arms race that would be costly and dangerous. Nuclear arms control has been particularly important during past times of U.S.-Russian tensions. It minimized the possibility for miscalculation or misinterpretation of military activities and headed off unintended or inadvertent escalation. The harrowing experience of the Cuban missile crisis in 1962 demonstrated the critical importance of effective dialogue. The maintenance of strategic stability is key to ensuring that U.S. and Russian nuclear policies are more predictable and less dangerous to one another and to the world. Measures such as reciprocal obligations, timely implementation of agreements, and verifiable compliance with nuclear arms control commitments have assured the leadership on each side that the other was not seeking military advantage. Yet, should the nuclear arms control regime be permitted to erode or even collapse, such assurances would evaporate. Each side would be more likely to adapt worst-case assumptions and move toward unconstrained nuclear competition. Arms control is also vital for addressing mounting challenges of nuclear proliferation. Should the United States and Russia enter a new nuclear arms race, it would be more difficult to prevent further spread of nuclear weapons. It would diminish the effectiveness of the regime based on the nuclear Nonproliferation Treaty (NPT), which is central to addressing the acute proliferation challenges posed by North Korea and Iran. This would further complicate the maintenance of peace and stability. The world should share concern that not only is further reduction in nuclear stockpiles difficult in the near term, but even existing nuclear arms control agreements are now at risk. Washington and Moscow are pursuing costly programs to replace and upgrade their Cold War-era strategic nuclear arsenals, with each side exceeding reasonable deterrence requirements. Further, a compliance dispute threatens the landmark 1987 Intermediate-Range Nuclear Forces (INF) Treaty. 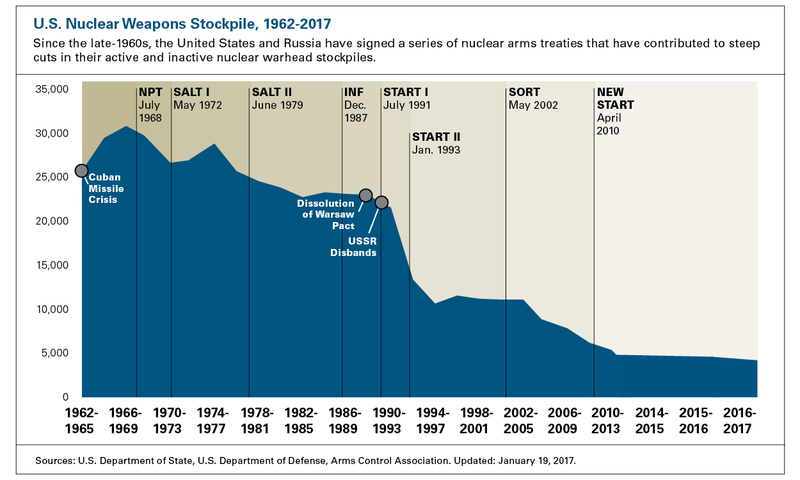 The 2010 New Strategic Arms Reduction Treaty (New START) is set to expire in early 2021, unless it is extended by agreement of the U.S. and Russian presidents or replaced by a follow-on accord. Should the INF Treaty collapse and New START expire without replacement, there will be no longer any legally binding limitations on the world’s two largest nuclear stockpiles. The consequences for effective cooperative management of nuclear risks and for nuclear nonproliferation would be severe. that this is not impossible. In March, Russian President Vladimir Putin noted in an interview with NBC that New START would expire soon and stated the readiness of Russia to continue a dialogue on nuclear arms control, to maintain the regime established by the treaty, and to discuss further reductions in nuclear warheads and delivery vehicles.3 Russian officials link any further progress in nuclear arms reductions to addressing other issues that may affect strategic stability, such as the deployment of a global U.S. missile defense system; development of high-precision, non-nuclear strategic offensive arms, and the possibility of offensive weapons in outer space. As their March 20 telephone conversation revealed, Putin and U.S. President Donald Trump keep the need to curb a nuclear arms race on their mutual agenda.4 Pursuing such measures does not imply or require a restoration of “business as usual” between the two countries. In fact, when Russian-U.S. political relations are at their worst, it remains in the vital interests of the United States, Europe, and Russia to contain nuclear tensions and prevent a new nuclear arms race. Recognizing the difficulties for returning to a comprehensive and complex bilateral and multilateral arms control agenda, the United States and Russia can and should take a number of steps in that direction as soon as possible. Following are the most urgent steps. Immediately extend New START. On February 5, 2018, the United States and Russia achieved the central limits of New START, which took full effect on that date.5 The treaty imposes important bounds on strategic nuclear competition between the two superpowers. As long as the Russian and U.S. programs of nuclear forces modernization remain within the limits established by the treaty, it meets its objective of managing the strategic stability between the two nuclear states. Although due to expire in February 2021, the treaty can be extended by up to five years by agreement between the two countries, without requiring further action by the U.S. Congress or the Russian Duma. Extending the treaty until February 2026 would preserve its significant security advantages, not only the numerical limits but also the mutual transparency provided by the treaty’s verification measures. Those measure include data exchanges, notifications, and inspections. An extension would buy time for the two countries to discuss other stabilizing measures, including further reductions in their nuclear stockpiles. Russian officials suggested in 2017 a dialogue with Washington on an extension of New START, but U.S. officials wanted to wait until the treaty’s limits were achieved and the Nuclear Posture Review was completed. Both conditions are now met. A swift extension of the treaty until 2026 could have the important benefit of improving the bilateral political atmosphere. Agreement on an extension would provide a positive achievement on the U.S.-Russian agenda and would help to fulfill their disarmament commitments under Article VI of the NPT. If New START is not extended, then in 2021 there will be no legally binding limits on the world’s two largest strategic arsenals for the first time since 1972. Unconstrained U.S.-Russian nuclear competition, in numbers and technology, would spark an arms race even more dangerous than that of the 1950s and 1960s. Resolve the INF Treaty compliance dispute. The INF Treaty made a major contribution to European and global security by eliminating all U.S. and Soviet ground-launched ballistic and cruise missiles with ranges between 500 and 5,500 kilometers. The treaty is now at risk, with the United States and Russia exchanging charges of treaty violations and the United States stating that it will not allow Russia to gain a military advantage through its violation. A collapse of the INF Treaty would end a landmark arms-reduction agreement; open the door to a U.S.-Russian arms race in intermediate-range missiles; further complicate relations among the United States, Europe, and Russia; and have negative repercussions for the entire arms control agenda. So far, the United States and Russia have reaffirmed their commitment to the treaty and have taken some steps to discuss their noncompliance complaints. Two meetings of the Special Verification Commission, established by the treaty to resolve compliance disputes, took place in 2016 and 2017. Those talks helped clarify the complaints, but did not result in any progress on resolving the disputes. The United States and Russia should intensify such efforts. As a next step, they should provide each other with demonstrations and technical briefings to answer U.S. questions about the range of the Russian 9M729 (SSC-8) ground-launched cruise missile and Russian questions about the ability of MK-41 launchers in Romania and Poland, intended for Standard Missile-3 missile defense interceptors, to hold offensive missiles. Yet, no further meetings of U.S. and Russian technical experts are scheduled to address this dispute. A resolution requires high-level leadership from the White House and the Kremlin. Maintain regular dialogue on strategic stability. After a break of several years, U.S. and Russian officials held a round of strategic stability consultations in September 2017, but subsequently postponed a follow-up round to be held in March. They should make this dialogue a continuing and regular part of the U.S.-Russian agenda. Given the evolving nature of strategic stability, maintaining stability today is a more complex question than during the Cold War. Whereas strategic stability previously focused only on U.S. and Russian strategic offensive nuclear forces, with some attention to ballistic missile defense, today’s stability model must account for third-country actors and new concepts and technological advances, such as precision-guided conventional strike systems and actions in the cyber and space domains. The dialogue should also include U.S., NATO, and Russian military issues, with a view to enhancing understanding and avoiding misperceptions. One topic should be the so-called Russian escalate to de-escalate doctrine, which posits a limited use of nuclear weapons in order to stop an overwhelming conventional attack on Russia. Russian officials deny this is an official doctrine, but it is taken as a reality by NATO planners and in the Nuclear Posture Review. An earnest dialogue on doctrine is essential in order to avoid lowering the threshold for use of nuclear weapons. U.S. and Russian diplomatic and military officials should pursue a broad, systematic, and continuing dialogue on these matters with a view to understanding the other’s concerns; clarifying misperceptions about key issues, including each side’s nuclear use doctrine; and at some point defining mandates for negotiations on specific issues. One important and most welcome first step in this direction would be publication by Russia of its more detailed nuclear posture in a format similar to that of the Nuclear Posture Review report. Sustain military-to-military dialogue on key conventional issues. Over the past five years, the instances of U.S. and NATO military aircraft and warships and Russian military aircraft and warships operating in close proximity to one another have increased dramatically. NATO has deployed ground forces to the Baltic states and Poland, putting them in closer proximity to Russian ground forces in Russia and Kaliningrad. These raise the prospect of accidents and miscalculations that would be in neither side’s interest and that could escalate to a full-fledged armed conflict, especially in the Baltic region or the Black Sea. Dangerous military incidents and brinkmanship have become a routine matter, as they were during the Cold War. The United States, NATO, and Russia have reactivated past arrangements in order to prevent incidents at sea and in the air and should continue to improve and update such arrangements. NATO and Russia should launch a sustained military-to-military dialogue on how to arrest any unintended or inadvertent escalation, avoid miscalculations, and reduce the risk of hazardous military activities in Europe. Despite the current tensions and the political difficulty of returning to the arms control agenda, the prevention of a new nuclear arms race requires joint U.S.-Russian leadership and urgent steps. There is the opportunity to reduce nuclear risk by recognizing that a nuclear war cannot be won and must never be fought. Important steps in that direction would come from extending New START, preserving the INF Treaty while resolving compliance disputes, and resuming discussion of the strategic stability agenda, from which both sides and the broader world community will benefit. 1. Office of the Secretary of Defense, “Nuclear Posture Review,” February 2018, https://media.defense.gov/2018/Feb/02/2001872886/-1/-1/1/2018-NUCLEAR-POSTURE-REVIEW-FINAL-REPORT.PDF. 2. John E. Hyten, statement to the U.S. House Armed Services Strategic Forces Subcommittee, March 7, 2018, http://www.stratcom.mil/Portals/8/Documents/2018%20USSTRATCOM%20HASC-SF%20Posture%20Statement.pdf?ver=2018-03-07-125520-187. 3. Office of the President of Russia, “Interview to American Channel NBC,” March 10, 2018, http://en.kremlin.ru/events/president/news/57027. 4. “Readout of President Donald J. Trump’s Call with President Vladimir Putin of Russia,” The White House, March 20, 2018, https://www.whitehouse.gov/briefings-statements/readout-president-donald-j-trumps-call-president-vladimir-putin-russia-3/. 5. Arms Control Association, “New START at a Glance,” March 2018, https://www.armscontrol.org/factsheets/NewSTART. 6. Kingston Reif, “Administration to Review New START,” Arms Control Today, May 2018. Thomas M. Countryman, a former acting U.S. undersecretary of state for arms control and international security, is chair of the board of directors of the Arms Control Association. Andrei Zagorski is director of the Department of Disarmament and Conflict Regulation at the Primakov Institute of World Economy and International Relations and a professor of international relations at the Moscow State Institute of International Relations. This paper is adapted from an April 2018 statement by the Deep Cuts Commission, of which both are members.